6½" compass with smooth-action rapid adjustment, durable cast zinc construction, and black fiberglass crown and reinforcements. 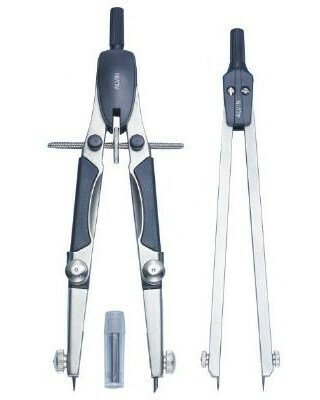 Features double knee joints for parallel leg positioning and precise drawing of large radii. Creates circles up to 12" diameter. 6" gear head divider has adjustable and replaceable needle points. Packaged in hard, see-through plastic case with spare lead.